Vehicular Manslaughter is a felony which is charged when intoxicated and drug impaired drivers cause the death of others. Before June 8, 2005, in order to charge someone with Vehicular Manslaughter, the District attorney’s Office had to be able to establish criminal negligence to prove Vehicular Manslaughter, but this requirement was repealed. 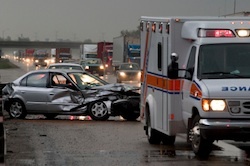 If you or a loved one is charged with Vehicular Manslaughter or another serious crime, contact the Westchester County Criminal Defense lawyers at the Law Office Of Mark A. Siesel through this online form or at 914-224-3086. When charged with Vehicular Manslaughter, you need immediate, experienced, and diligent legal representation as you are facing potential jail time, significant loss of driving privileges, fines, and the combined effect on your personal life and employment—we are here to help. Operate a snowmobile or ATV while intoxicated or impaired by drugs, or a combination of both, and cause the death of another person by the operation of that snowmobile or ATV. Has a previous conviction under this statute or the Vehicular Assault statute. When you or a loved one has been charged with a serious criminal offense such as Vehicular Manslaughter or Vehicular Assault, contact the Law Office Of Mark A. Siesel with our online form or at 914-224-3086 for experienced, knowledgeable and dedicated legal representation.